Windows may have compatibility issues with some device drivers, which may cause problem to the stability of the system. Luckily Windows keeps a backup copy of the old driver that has been replaced, and allows users to easily roll back or go back to the previous version of the driver. In Windows XP, Windows Vista and Windows 7, click on Windows Start button, then right click on Computer and select Manage on the right click context menu. 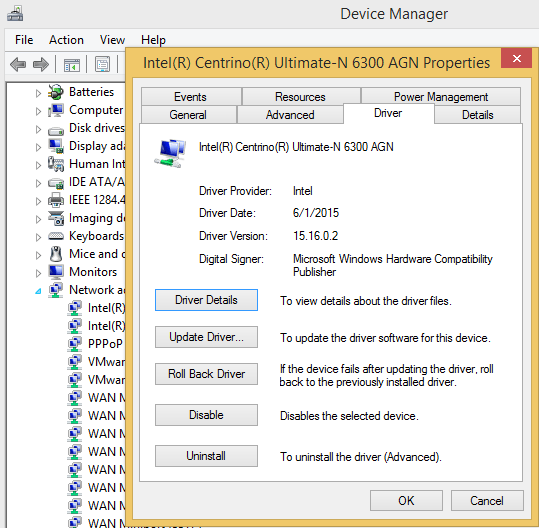 Then, open Device Manager by clicking on Device Manager. In Windows 8, Windows 8.1, Windows 10 or later, open Win-X Power Users menu, and select Device Manager. In any case, if there is any UAC security prompt, click on Continue, or enter password for administrator. Expand the hardware component category that placing device with corrupted driver by clicking on the small plus or arrow sign next to it. Inside the category, look for the device entry that you want to rollback its driver to previous version. Right click on the device, and select Properties. Click on the Roll Back Driver button, and confirm when prompted with dialog box asking if really want to proceed to get previously installed old driver software re-installed again. Note: User must logged on as an administrator to rollback a driver update. Beside, if there is no previous version of the driver software installed for the selected device, the Roll Back Driver button will be unavailable (grayed out and disabled).